When you hear the word branding, you mind may immediately go to marketing. Even though they do have quite a few similarities, there is a notable difference between marketing and branding. A brand is formed through multiple experiences when it comes to a service, product, or organization. It can be formed within the mind and can be reinforced with everything that you put in the public eye. Marketing tactics are a bit different even though they have some of the same elements as branding. Marketing is a push tactic, not a pull tactic and can often times be quite unconventional. Marketing helps bring new customers into the business or the product. It is a form of one-on-one communication and helps to promote the product or services of a particular brand. It has the ability to influence a customer’s decision to make a purchase. The primary difference between branding and marketing is that marketing is intended to promote a product or service, whereas a brand building strategy has the ability to reinforce it. If you have a service that is not up to standards, marketing may help you get an extra sale. However, it is with branding where you have the power to enhance that substandard service. Comparing branding and marketing is sort of like comparing the moon and the sun. They are both bright and have positive benefits, but one shines all day and the other one lights up the night. Branding is like the sun as it enhances your product and gives you that added boost you need to make that product or service better than ever. 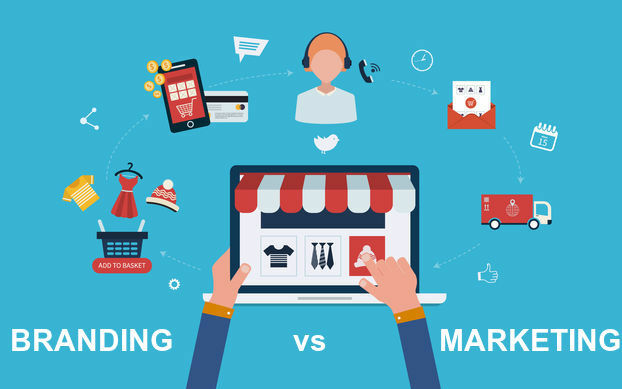 Marketing can be very beneficial, but there are many different types of marketing so it may be hard to choose which one will be most effective. If you need help, contact our digital marketing agency in Houston today! If you are not sure where to head next on your journey with branding, you might want to consider branding consultancy. Paying for Houston brand building services can help you enhance your business’ products and services while helping you free up more time helping the customers and clients. It saves you a great deal of time, money, and effort in the long run. Contact MARION today for more information about how professional branding services can help you step up your pricing and improve your bottom line.